The Boss asked me to fill in for her today while she takes care of Glogirly. I'm super excited because this means I get to tell you about our latest GIVEAWAY! It's really special too, because it's a beautiful gift for your person. Mark Poulin Jewelry is a talented team of whimsical artisans. (you can meet them HERE) They make jewelry, magnets, charms and more. Glogirly absolutely LOVES their graphic design-like style. It's immediately recognizable. Modern, hip, adorable, animated. Oh, and did I say CATS??? Lots of cats. They contacted Glogirly recently and invited her to pick out her favorite jewelry piece. She was like a kid in a candy store... One of her favorites, and one of Mark Poulin's most popular necklaces, is the Little Angel Kitty. She said it reminds her of Nicki, the kitty that came before me and the Boss. The sterling silver kitty is 1/2 inch tall and hangs on your choice of a sterling silver or silver plated chain. Glogirly's is an 18" chain, but they also do a 16" and a 20".I'm not allowed to wear it, so we hired Black Cat to be our photo shoot model. A good photo stylist has to make sure the model is properly dressed. Here's me trying to put the necklace on Black Cat. 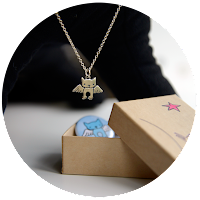 The necklace is beautifully packaged in an adorable kraft box with a leaping kitty illustration. Tucked inside with the necklace is a matching kitty angel magnet. He's got wings too...but I don't think he can fly. 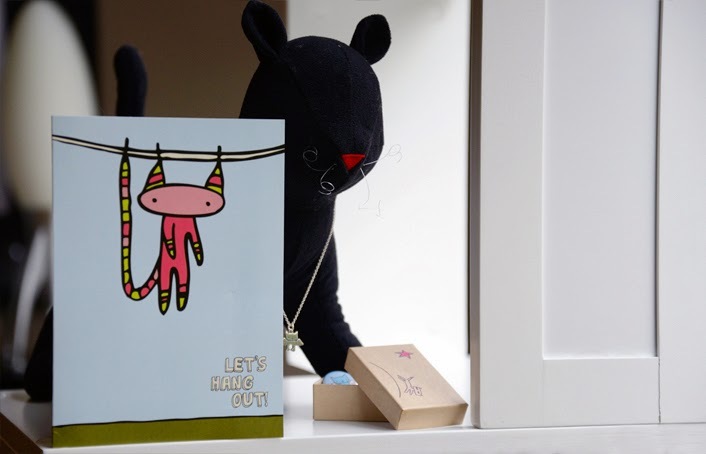 This adorably funny greeting card was included in our package. It's blank so we can pick someone really special to send it to. I just hope the Boss doesn't get any ideas and try to pin ME to the clothesline. 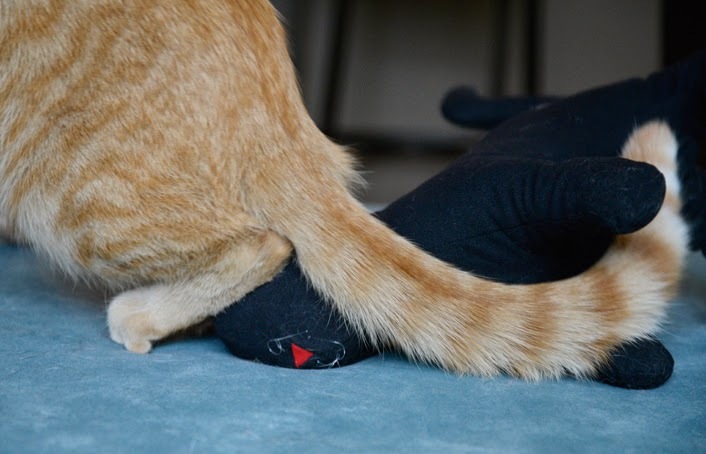 So kitties, here's the REALLY cool part. One lucky GLOGIRLY reader, anywhere in the whole-wide-world, will win their very own piece of Mark Poulin Jewelry. The winner can choose anything they'd like from their collection, up to a $50 value. 1. Visit the Mark Poulin Jewelry Website or their adorable Marmar Etsy Shop and pick out your favorite piece. 2. Come back here and leave a comment telling us about your fave. 2. Like Mark Poulin Jewelry on Facebook. 4. Follow Mark Poulin on Twitter. 6. Follow Mark Poulin on Pinterest. 7. Follow Mark Poulin on Instagram. Deadline to enter is 11:59pm EST, Sunday October 13. Giveaway open to readers worldwide. Winner will be drawn randomly using Random.org. Winner will be notified via email and must respond within 48 hours with name and mailing address. Ooooh love these. My pick are angel kitty earrings! Liked Marc Poulin Fb page. I already follow Glogirly on Twitter and tweeted about the giveaway! I already follow Glogirly on PInterest and pinned the giveaway! Very cute. The hedgehogs are adorable. Pricilla maaas, "Sheeps? Sheeps? But no goats? I see my cousin the deer but NO GOATS?!" space kitty and angel kitty necklaces! I see Waffles in black leather, gangsta pose, 2lb gold necklace with WAFF2 charm.... I know, I'm in therapy for it. Oh, I love, love, LOVE the kitty angel necklace! 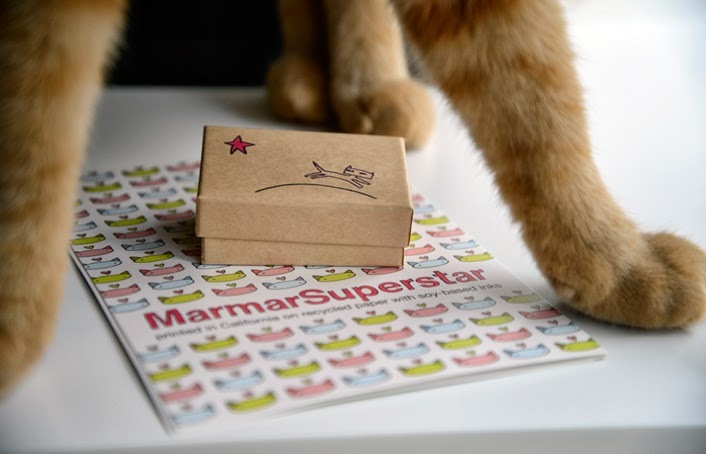 Their stuff is so cute and I've spent a bit of time browsing their Etsy shop in the past. It's so hard to choose just one thing I like but... I like the Punk Kitty Glass Necklace, Turtle Necklace, and the Cupcake Necklace! Following Glogirly on Twitter and tweeted. Following Mark Poulin Jewelry on Twitter. Love the angel kitty necklace on the sterling chain! So cute! 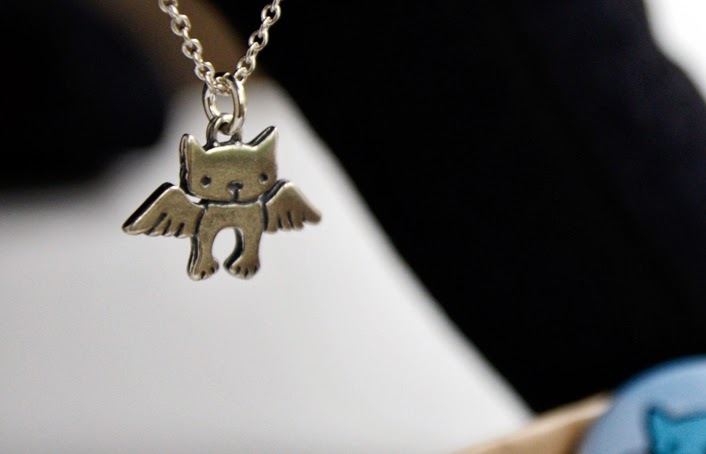 We think our mum would love the Kitty Angel on a 20" sterling silver chain. Because our mum is a kitty angel without fur. She gives us everything a cat could want and more. I love the Little Cat earrings. Following you on Facebook, of course! Following you on Twitter and tweeted the giveaway. Now you'd think she'd pick a kitty one, but no... Rumblemum LOVES the Geometric Triceratops Pewter Necklace so much! Finally she gave decided that her favourite is Peek-A-Cat necklace. 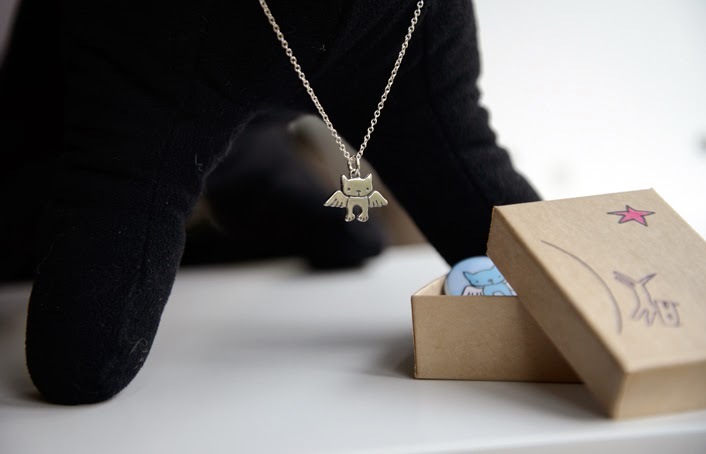 We LOVE the angel kitty necklace!!! We LOVE this jewelery. My favorite is also the Angel Kitty necklace. We "Liked" Mark Poulin jewelry on Facebook. The jewelry is wonderful! We love the angel kitty necklace especially, but the octopus-kitty made us MOL. We follow you on Twitter, too! Oh what a wonderful idea for a present for the Mom. We likes the Alley Cat Necklace. It is so cute and it has a heart on it. We thinks it is adorable. We love the Rocket Kitty since we live on the Space Coast of Florida!! We follow you on Twitter and tweeted the giveaway. We follow Mark Poulin on Twitter. We follow you on Pinterest and pinned the giveaway. We follow Mark Poulin on Pinterest. We're following Mark Poulin on Instagram. pee ess - your link takes us to Twitter. OMC! So cute! We would like any of the cat pieces. The mom wonders if he does anything in 10K or 14K gold or just SS. We follow Mark Poulin on FB. We follow MP on Twitter. We follow MP on Pinterest. We'll work on Instagram...the mom forgot her password for it. This jewelry is so adorable. My fave is the silver dinosaur charm necklace. Love all of Mark's jewelry, but I love the Cat Fancy Charm Bracelet best! I've been following Glogirly on FB for ages!Does that count? I love Pinterest, I was happy to find out Glowgirly is on Pinterest. Following Mark Poulin on Pinterest too. we love that angel kitty. you know we LOVE Mark's jewelry (since you won a piece on our blog)...and we have featured him, so don't enter us! Good luck to all who enter, they will love it! We already follow you on Facebook. We would choose the Cat Family glass necklace, because it has three kitties on it, and we love triple kitty things! Mom likes the alley cat necklace. I have my very own FB page. Liked glogirly. What a great giveaway! We like the Punk City Glass Necklace. We like anything "kitty". We liked you on Facebook and we follow Glogirly. Wow! It is furry furry nice! They have lovely things. Thanks for linking to them! Thank you for sharing. The angel kitty necklace speaks very much to our hearts right now. I followed Mark on Instagram! We liked Mark Poulin on Fb, followed him on twitter, & followed him on pintrest. Our email is KittiPooEB@yahoo.com. I follow two of Mark Poulin's boards on Pinterest. I love the little angel kitty necklace. I already like glogirly on facebook! 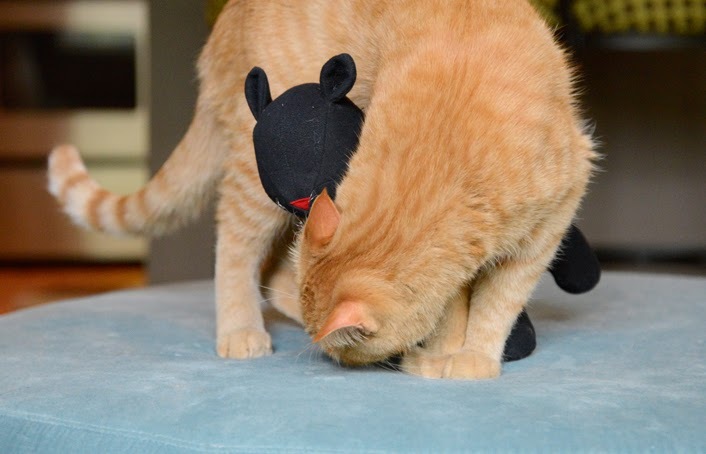 LOL, we love that pic of Waffles doing black cat control! And an awesome giveaway. I love the little sloth necklace! - Crepes. We like this and would have it customs done for Mum and Dad as Dad loves owls. GO Waffles mate, doing good with the stylist malarkey. PPS. T4ll Mum to get well soon OK? I follow glogirly on twitter and I tweeted! And I would enjoy wearing the little sloth necklace. - Alana. I would love the pocket pup earrings! Check out the tailio! I think I like the Alley Cat Necklace or the pocket cat family necklace or the cat fancy charm bracelet. Wait, do I have to pick one??? No fair. We'd like to win the pewter sabre-tooth tiger kitty! Yes we would! 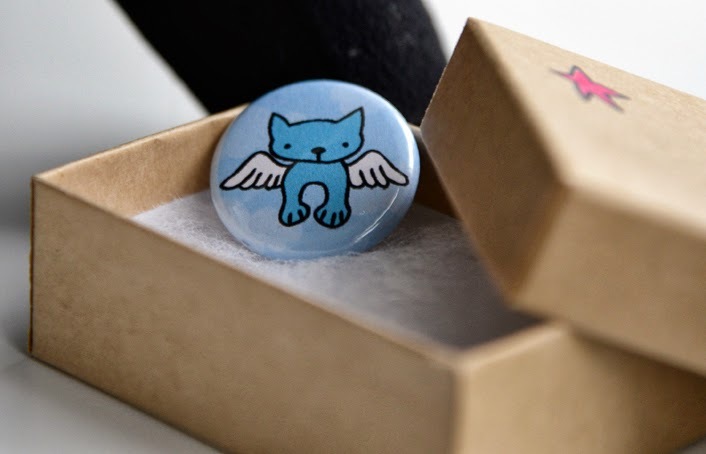 Wolfman & Toodles LOVES the Angel Kitty Earrings!! So cute! I'd love the angel kitty earrings. I always like you on facebook! Well... first the peep picked out the planet heart necklace 'cause it reminded her of how much she loves me. But then she spotted the Fluffy Sheep necklace and went all oohy and ahhy on me so I guess that's her favourite now. I've already liked you on FB. Now I've Mark Poulin on FB, too! I already follow you on twitter but I tweeted 'bout your giveaway. Now I'm followin' Mark Poulin on FB, too! Eeeee, I love this jewelry. My favorite it the Stick Kitty Glass Earrings - they are whimsical yet classy. Liked Mark Poulin Jewelry on Facebook. Followed GLOGIRLY on Twitter & tweet the giveaway. 4. Followed Mark Poulin on Twitter. Followed GLOGIRLY on Pinterest and pin the giveaway. followed Mark Poulin on Pinterest. Followed Mark Poulin on Instagram. Gorgeous! Our heart loves the Little Angel Kitty Necklace. Love the angel kitty and dog necklaces. Follow you on FB and like Mark Poulin on FB too. I recently lost my number one boy, Simon, and the angel kitty necklace would be such a sweet reminder of him; especially when I didn't get the paw print I wanted. I also love the Little Stripe Heart Necklace and the Little Cat Charm Necklace. I honestly don't know which one I would pick. Like Mark Poulin Jewelry on Facebook. Follow GLOGIRLY on Twitter & tweet the giveaway. Follow Mark Poulin on Twitter.